Greetings to all pirates, brigands, and ne'er-do-wells. As a new arrival to the Caribbean, I hope to establish m'self as a reputable dealer of... acquired goods. This month, we has a fantastic selection to provide you today. A classic returns, the Admiral outfit be just what it says on the tin, worn by admirals serving His Majesty's Royal Navy throughout the world. A shipment of them “fell off the back of a galleon” last month, I salvaged most of 'em and am now offering them at a reasonable price. What ye do with yer Admiral disguise -erm- outfit is up to you of course, but now ye can get it cheap. If not from me, from any of me fellow peddlers around the Caribbean. Now, for the news I be most excited about. Late last month, a galleon flying the colors of that Flamboyant Spanish Foppsy, "Lord" Garcia de Avaricia caught me eye. The galleon were swarmed by a fleet of sloops flying French colors, and quickly sank. From the wreckage, I managed to salvage several Spanish Privateer outfits, which will be available for purchase this month. 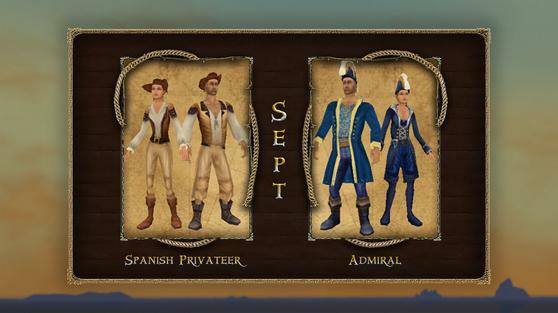 So, if ye like to privateer from time to time, or just want mates to think you do, make sure to grab this outfit while it's hot! Ye can purchase these or any other available outfits from myself, Kat Repperson, in Las Pulgas on Padres del Fuego, next to Goslin Prymme's tavern; or if I be too out of yer way, from any of my more established peddler brethren on Port Royal, Tortuga, Padres del Fuego, and Cuba. We may only have enough of these fine wares to last a short time, but I’ll be here to stay mates. Make sure ye come back next month to see the newest loot--erm I mean lot of garments!